New York Has Solved the Problem of Public Art. But at What Cost? OY/YO sculpture by Deborah Kass. Photo: Etienne Frossard/Courtesy of Two Trees Management Co. 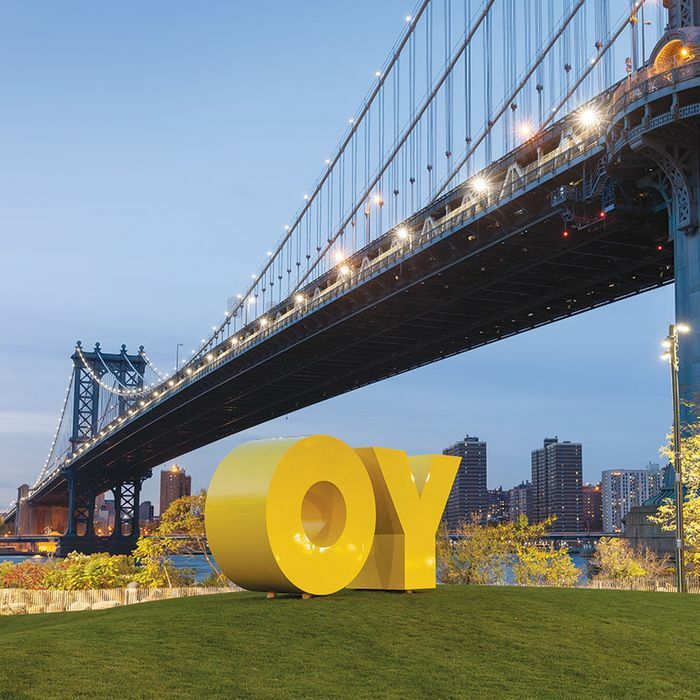 There in the little park between and in the shadows of the Brooklyn and Manhattan bridges, Deborah Kass’s large, Lik-M-Aid–yellow sculpture OY/YO lands right in that magnificent sweet spot — endlessly majestic, riddled with Whitman, Hart Crane, and the American Dream. The sculpture speaks in wonderfully multicultural tongues — a cuter new combination of Robert Indiana’s iconic LOVE and I ♥ NY. You can feel the frisson triggered in the mind when reading the word YO from Manhattan; and maybe you realize, instantaneously, that the word flips into OY when seen from Brooklyn — a simple two-liner joining east and west and spinning like a cosmic compass. And just like that, you’re in New York, hearing America singing in all its argots and colloquialisms. Just as you think, How’d I never notice that before? the mind supplies the sculpture’s invisible exclamation point. It is such a simple joy to feel the real rhythms of the city and see this perfect public sculpture, especially in an age when public space seems more and more turned by developers into private arcades for the privileged. I hate this historical turn, which for me is contained most neatly in the High Line, that stretch of elevated rail lines strung through the Meatpacking District, West Chelsea, and the Hudson Yards, refurbished with private money a dozen years ago as the spine of the massive luxury redevelopment of each of those neighborhoods. The trend I mean is this: toward ersatz, privatized public spaces built by developers; sterile, user-friendly, cleansed adult playgrounds with generic environments that produce the innocuous stupor of elevator music; inane urban utopias with promenades, perches, pleasant embellishments, rest stops, refreshments, and compliance codes. And yet, as an art critic, I have to admit, from Rashid Johnson’s vexing yellow sculpture that looks like a prison and a butter factory to Adrián Villar Rojas’s cast cement modern Mayan “ruins” on the High Line to Kara Walker’s magnificent sphinx from last summer to that sweet Deborah Kass sculpture (both commissioned by the Brooklyn megadeveloper Two Trees), this semi-privatization of public space has produced some of the best public art the city has seen in decades — in fact, it may even have cracked the seemingly impossible task of staging good public art. How? By handing the job of curating it to an autonomous art-world insider rather than a public panel of judges, politicians, bureaucrats, architects, or businesspeople. This move is especially helpful in an era when money and art are already mingled together to an unprecedented degree — meaning that these groups of people, the ambitious curators and the money people who make major projects actually happen, are far from strangers; in fact, immensely well-acquainted. This, by the way, is another phenomenon I hate. So what am I supposed to do when cultural forces I loathe are responsible for something like a new golden age of public art, which I always felt was important, but also maybe something like impossible? To examine that dilemma, and the cultural forces that have made good public art seems perhaps impossible, let’s start with the High Line, which so perfectly captures the dilemma, it might as well be a parable — or a paradox designed to expose my hypocrisies. 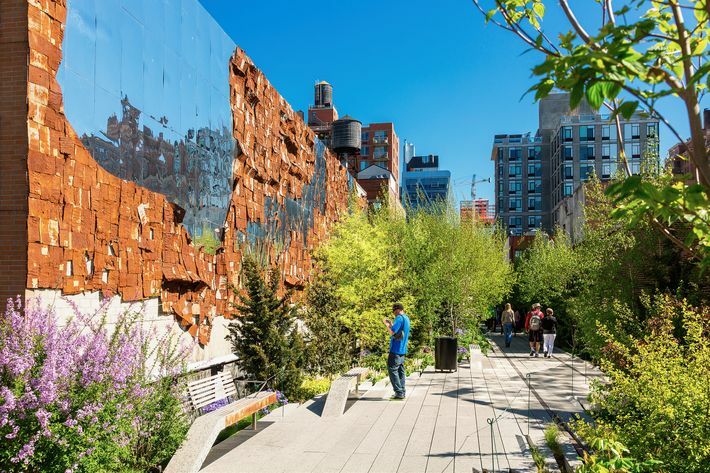 With over 27 million visitors since it opened in June 2009, and annual attendance above 6 million, the High Line is New York’s most popular cultural attraction — a blockbuster. More people go to it now than to MoMA or the Met. It’s a mile-long, amenity-filled, urban nature theme-park. (I’ve met one of the two guys who got it all going and still makes it run, Robert Hammond — he’s a great guy.) Popularity notwithstanding, not only do I feel oddly creeped out by its canned, fabricated naturalness, closed in by its conveyor-belt-narrow walkways, and irked at its romance with ruins, for me, the High Line is the harbinger of a bad pathogen now transforming public space into fussy, extra-busy, overdesigned, high-maintenance mannered playgrounds, curated experiences, and crowd-pleasing spectacles. Like most transplanted New Yorkers, I love the city, and the madness and chaos of its crowds. But the High Line has never felt to me to truly be a part of New York. It’s an undead limbo; protective custody for tourists who traverse this artificial highway while reaching scripted architectural incidents and overlooks. Going there is a form of volunteer rendition into a comatose puppet show. Making it all the more uncanny for an art critic is the bizarre jujitsu whereby the High Line is this huge tourist destination that channels people above the art galleries of Chelsea but never seems to discharge any of them into the galleries. (Maybe this is a blessing.) This new funfair architecture produces a kind of hysterical blindness that allows people only to see it, the High Line, its design and features, while making the real city recede, except as a backdrop and photo op. I don’t know any local who goes there the way they go to other parks. No matter; developers and architects love this sort of thing, as two similar spaces will soon be built at either end of the High Line. I’m talking, of course, of Pier 55, at the southern end of the High Line, and the Culture Shed, at the northern one. Both are nightmares of synthetic space. Let’s take the first one first. 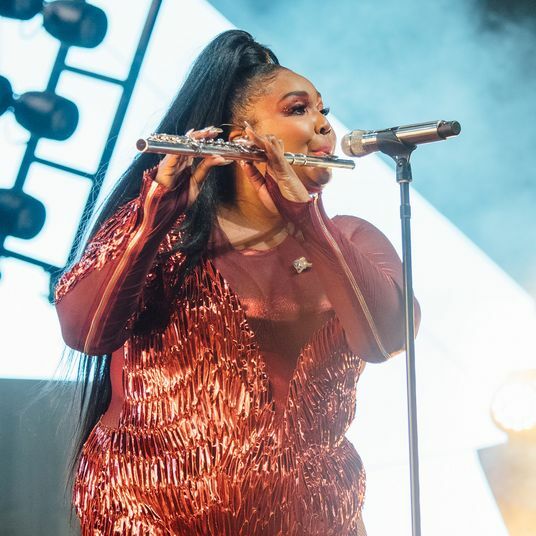 This private venture, paid for by, among others, Barry Diller and Diane von Furstenberg, has been designed by hip British architect Thomas Heatherwick. 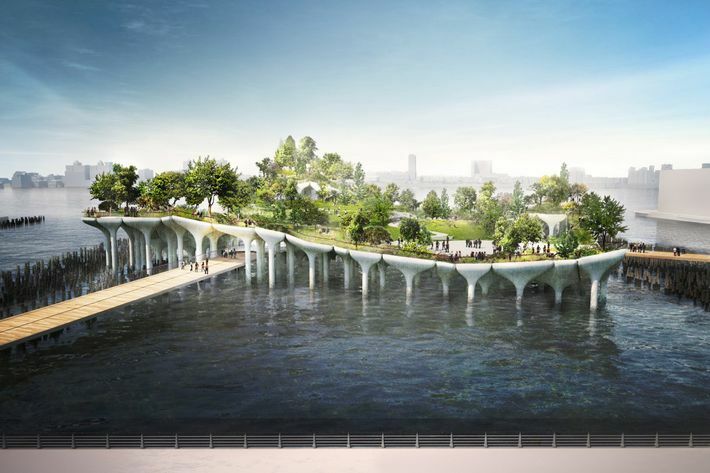 Like many of his ilk, he self-identifies as a “designer of sculpture.” Basically, Heatherwick’s Pier 55 is an updated Studio 54. It will be a floating fantasy island in the shape of a shelf-mushroom resting atop pilings capped with giant flower pots. In addition to Frenchified and Italianate touches, water features, a 700-seat amphitheater, and other ornamentation of no structural interest, the New York Times reports it will include “a densely planted, intricately picturesque landscape … a 62-foot hillock tops a grassy bowl … and pre-ruined staircases.” Think Nickelodeon game-set — or, as Jason Farago put it in the New Yorker, “A privately funded fantasia in a city whose public infrastructure is crumbling.” At a tiny fraction of the cost and maintenance, the city might have restored the pier in its flat rectangular reach into the majestic Hudson and entrusted the Whitney to oversee any public projects. Yet Pier 55 is small potatoes compared to the bugged-out behemoth under construction at the High Line’s other end — perhaps the most soulless large project in New York’s history. Spanning the spectacular 26-acre riverfront site over the Hudson Yards between 30th and 34th streets — the last best site in Manhattan — is Culture Shed. (Finally, a name more bloodless and annoying than Citi Field.) Its designers are among the progenitors of what critic Alexandra Lange dubbed “gadget architecture.” Namely, Diller Scofidio + Renfro — the same firm that designed the tilted park and angled overhang thing at Lincoln Center, the ones who, in place of the recently razed American Museum of Folk Art, are designing the already-contested new MoMA. With James Corner Field Operations, Diller Scofidio + Renfro is the very firm responsible for none other than, ta-da, the High Line. Developers love them. In all honesty, I don’t think I’ve ever seen a design I loath more than this one. Or as busy. Culture Shed will include performance centers, exhibition spaces, theaters, video screens, and two really big buildings or sheds or skyscrapers or office spaces or something. It’s always hard to determine with these sorts of designers in general, and DS+R in particular, as their drawings are slick but vague, and the firm always says everything is in progress. You can’t pin them down. 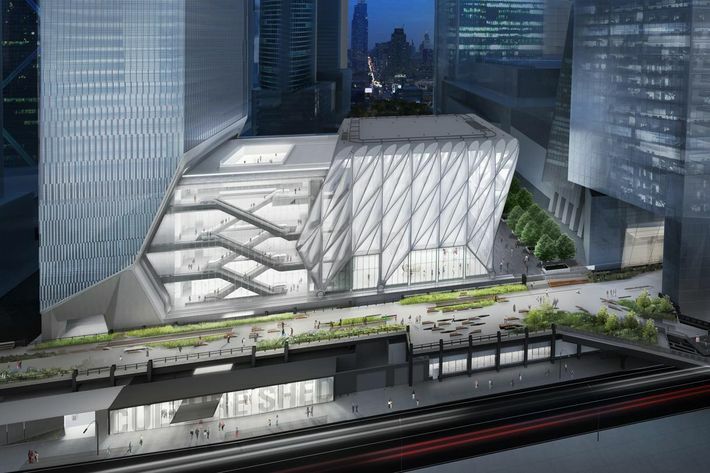 Indeed, Culture Shed is well under way, and as with MoMA, few have any idea of what’s in store. (How did all the architecture publications and writers allow this to happen without debate?) I was in a three-hour meeting with them once, and had to raise my hand and ask if what were continually being referred to as “interpretable transparencies” meant windows; they looked at me blankly and said, “Yes.” The drawings are often sketchy, unfinished, and unclear — but always coolly computer-futuristic-looking, with lines going through other lines, decorative transparent planes that may or may not be part of the plan, and shadowy, selfie-taking people perched like marionettes here and there, looking at other people. Always looking like a mall. One structure will supposedly be 170,000 square feet; the other, 200,000 square feet. How gigantic is this? That’s about seven new Whitney interior-exhibition spaces. And even if the actual exhibition space is eventually eaten up by architectural elements, the combined exhibition footprint is probably still bigger than the Met. All this space is supposedly for art, entertainment, theater, film, and all the new-rage cultural-programming nine yards. Already, most of the space looks typically big, bloated, and empty, but for aggressively neutral vast open architectural spaces that belong in Abu Dhabi, not New York City. We all remember when public space didn’t have this horror of not being busy, chichi, stylized, loaded with performances, programming, entertainments, display, events, and happenings. Bane to the new privatized public space is quietness, slowness, whimsy, stillness, different rhythms, anything uneasy, aimless, inner-directed, accidental, odd, or antithetical to being “purpose-built.” There’s no room for silence here. Users of these new spaces are bullied for the duration of time spent here, kept busy, stimulated, programmed like robots and kindergartners. Here the mind dies, memory rapidly decays into some monotonous, impoverished tedium. People here are not immersed but deeply controlled, reduced to audience, made intensely passive by these prison houses and hamster wheels of showmanship. Everything is so planned and ordered that the imagination and emotions are driven out of these spaces. When I’m on the High Line, walking single-file and darting around people, or seated on one of the placed bench-features, I note a narcosis slipping in, a numbness that clouds my focus and turns me into an extra here, just another closed-programmed system — what Marshall McLuhan called a “servomechanism.” It creeps me out! The hubris of all this will be how costly these spaces are to build and maintain — predicated as they are on the belief that there will always be enough money for crews and equipment to come in at night and restore them for the next day’s audiences and merrymakers. It’s fitting that when this cycle of abundance recedes, these caprices may become the very “ruins” that inspired them. Pier 55 and Culture Shed present themselves as neo-liberal and egalitarian, open, not about class, money, privilege, or elitism. Yet these are the exact things that they’re about! These things are in constant operation on these sites; they’re just camouflaged by scenic views, architectural features, surveilled supervision, planned group seating, monitored selfie spots, and other theatrical dramatics. I can’t image people kissing — or more — amid any of it. I know, of course, that many of the public things I love about the city often rest on some highly questionable political, social, or economic private scaffolding. I accept this as the paradox of modern life. And love it. Take Central Park — as handmade as anyplace in the city, but one in which I still feel like I’m in nature. I love drifting there, being alone in crowds, not knowing how I came to sit where I’m sitting, on the grass, beside what seems to me a primordial outcropping, under a tree, near a path. Here I’m inside myself, but feeling the rhythms of the city. Instinct kicks in, some other life takes over, something outside of time, made up of the present, the past, memory, unknown sensations. A me I know and don’t know. In this psychic space, an hour becomes much more than an hour. In these spaces, I’m within this enclosing volume where space and self merge and become a vessel. I feel my inner book being written and rewritten. I’ve felt this in squares, city plazas and gardens, and other public spaces. I’ve even felt it on that traffic island in the middle of upper Broadway, and in that paved park between Christie and Ludlow streets. Importantly, I’ve been in all these spaces at all times of the day: dawn, dusk, in the middle of the night, meeting people, hoping, being alone, finding or losing myself. That’s over. The new hyperspaces are parks only for the day. Not for the night. The new spaces are not for dreaming. Or love, writing, working, worrying, or anything unknown. At night, these gussied-up spaces are for whatever entertainment might be planned. And maintenance crews. But I’ve walked alone for hours in Central Park, day and night, searching for psychic quiet in moments of personal crisis, breakups, and breakdowns. I pass a hillock around 67th Street where I remember breaking up forever with a lover; elsewhere, I remember coming undone after a woman told me we were through and came into such close contact with me that I thought I’d die. Should we talk about going into the park to gather ourselves after visiting doctors or loved ones in hospitals? Perhaps only to say that this is all but unimaginable on the High Line or Culture Shed and Pier 55. I’ve sat in Tompkins Square Park insomnia-ridden, feeling sorry for myself, scared, searching for a way to be. Yet I was healed in these spaces — space as balm, places to be my inner self but not be totally alone. That’s gone now. The rub with all this is where public art comes back into the picture. Art complicates things for me. As I said at the start, as much as I hate the High Line, it poses a dilemma. I really like its public-art program, overseen by one of the best curators anywhere, Cecilia Alemani. In other words, the gateway developmental-architectural source of a lot of this bad public space is a paradox of modern life. This stretches into a personal eternity of internal conflict for an art critic. On the one hand, I deeply believe that public art should be part of the public sphere. Art has always wanted to commune with strangers outdoors. Yet the best public art of the last two decades has largely been privately funded. Moreover, almost every piece of great public art was essentially selected by one curator. Or one art organization. Insiders. It turns out that I love art in public places, but only when the art is not picked in any public democratic way. That means the High Line got this right. It’s not an exception either. Consider some of the best works of public art in New York in the last 20 years. Jeff Koons’s Puppy in front of Rockefeller Center, which I’m still convinced might have quelled even Osama bin Laden; Rob Pruitt’s Union Square Andy Warhol Monument that should be permanent; Sarah Sze’s underground room at 60th Street that made me feel like the Crab Nebula was beneath New York; Rudolf Stingel’s gigantic rug at Grand Central Terminal; Josephine Meckseper’s working Times Square oil derricks; Liz Magic Laser’s restaging of famous movie scenes on the Times Square bleachers; and Francis Alÿs’s amazing parade of replicas of MoMA masterpieces (not to mention the real Kiki Smith) carried across the 59th Street Bridge. Every one of these public works was either privately funded or selected by an “expert.” Not politicians, architects, and developers. Not the public. 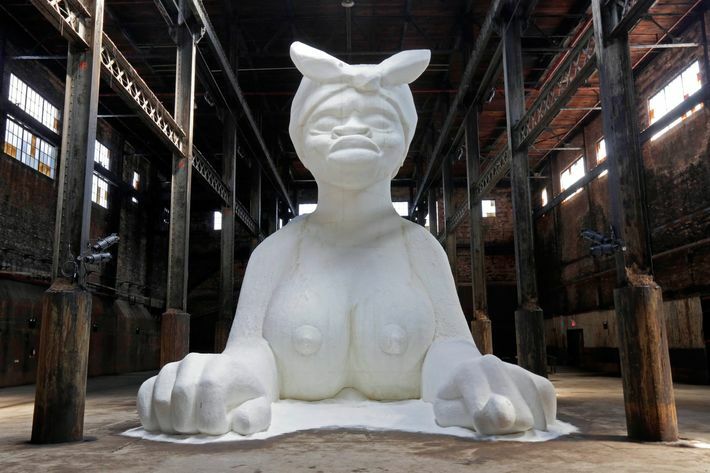 I haven’t even mentioned maybe the best of them all, Kara Walker’s pharaonic sugar sculpture commenting on slavery and labor practices in the magnificent Brooklyn Domino Sugar Factory. This is the paradox of public art in a nutshell: The project was primarily paid for by the site’s owners, the Walentas family, and was essentially a marketing device for the buildings going up there soon. As an art critic, I have to ask how we got to this strange place. 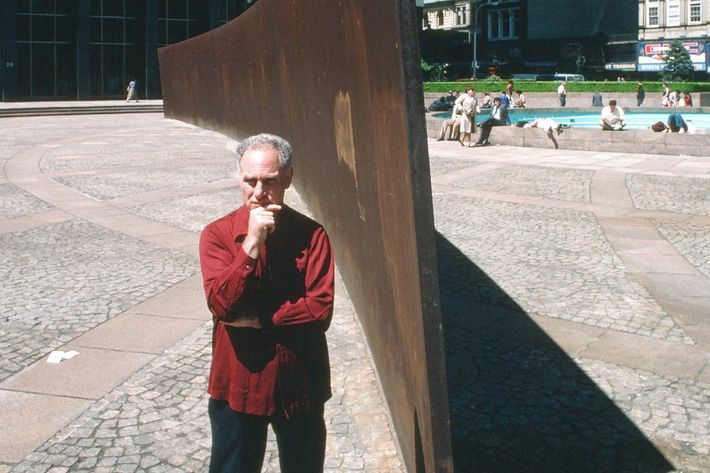 I think all the roads of bad public art and, as a result, this new terrible public space lead to 1979, and to the Government Services Administration commissioning Richard Serra’s tremendous Tilted Arc. In 1981, this great curving-steel masterpiece of post-minimal sculpture was placed in the building’s otherwise awful barren plaza. It was an incredible sight! Something like the dawn of a new idea of public sculpture that could raise space to something like grandeur and even comment on the horrible architecture of many civic buildings. But everything went to hell. The $175,000 sculpture (today it would cost tens of millions) was immediately derided by workers, judges, lawyers, civil servants, politicians, and others who worked in the building—who saw it as an insult, threatening, a giant strip of rust. This hatred seethed and came to a head when Ronald Reagan named a bureaucrat to oversee a 1984 public hearing on Tilted Arc. Looking back, the work’s fate, and maybe public art’s, was effectively sealed then. The New York Post stoked the hatred as the art world organized, rallied, signed petitions, staged protests, and authored editorials. The hearings took place between March 6 and 8, 1984. In all, 180 people spoke before an appointed panel of judges. By far in the majority, over 120 people spoke to retain the work, including even then–Museum of Modern Art chief curator William Rubin, who called the sculpture “a powerful work of great artistic merit.” Only 58 people testified against it. Yet the battle had already been cast in the press as the poor, beleaguered workers versus the rich, snotty art world. In 1985, a judge ordered its removal. After years of delays, in the middle of the night on March 15, 1989, Tilted Arc was dismantled and carted away to a warehouse in Maryland, where it still rests. I still see it in all its invisible glory when I pass the now-nondescript plaza. From here, it only got worse. The culture wars began the same year as the anti-art sentiment erupted around Tilted Arc. Politicians all the way up to the U.S. Senate got into the act. The tabloid press went along for the ride. Under the guise of budget-cutting and the public good, Republicans went on the warpath, assailing the NEA and artists like Robert Mapplethorpe, Karen Finley, and Andreas Serrano as being chosen by experts and receiving public funds and displaying vulgarities in publicly funded spaces. The cultural warriors wanted nonprofessional panels of non-art people to pick art. Laymen like them. The art world rallied mightily, but, truth be told, by then it had been decimated by AIDS and had been on the nonstop activist offensive for a decade. Thus, while ably defending Mapplethorpe and the other artists, when it came to public art post-Serra, a different, totally nonconfrontational strategy was taken: acquiescing and trying to make public art and bureaucracy work together. This led to the second and final failure — one that still resonates. The year after Tilted Arc’s removal was ordered, Bronx-based sculptor John Ahearn was selected to install three painted bronze sculptures in front of a Bronx police station. The acquiescence and eventual failure was in how the Ahearns were selected. To avoid a repeat of the Serra disaster, public-art agencies and other activists helped fashion a large committee to choose an artist for the Bronx commission. The Ahearn panel included police representatives, Department of Cultural Affairs members, the Bronx Museum curator, local politicians, artists, community leaders, and other committee members. Among other things, it was stipulated that the commission was to be “colorful” and “work with the community.” This bureaucratic compromise was a recipe for disaster. That came in September 1991, when the three Ahearn sculptures were installed. Each was figurative, painted, fun, and spunky-looking. There was a roller-skating black girl, a black man with a boom box, and a hooded Hispanic kid with a dog. Ahearn had depicted real neighborhood people cast from life. No matter. Before the work was even officially unveiled, the New York Post went ballistic with the headline “ANTI-Black.” That was probably that. Even though Ahearn was an activist who regularly worked with members of the community, even co-authoring previous sculptures with area residents, and had lived in the neighborhood for years. He was said to be creating “negative stereotypes.” The man was described as “a shiftless fat slob with a boom box”; the boy was called “a junkie with a dog.” Ahearn was branded as a “racist.” Adversaries claimed he should have made statues of Martin Luther King Jr. or kids in graduation gowns. Unlike the decade-long unraveling of Tilted Arc, the Ahearn fiasco unraveled fast. Ahearn was said to be “insensitive to the African-American community,” called “a white artist in a third-world community.” A politician said he failed “because he’s not black — it’s a simple as that.” It was a mess. Ahearn’s work was removed five days after it went up. By 1999, then-mayor Rudolph Giuliani could find an eager audience when he railed against the Brooklyn Museum’s funding a black artist’s painting of the Virgin Mary. The Ahearns are now permanently installed outdoors in sculptor Mark di Suvero’s Socrates Sculpture Park in Long Island City. In this way, the 20-year decline in the trust between art and the public allowed developers, architects, and entrepreneurs to move in. One final irony is how much bad new public spaces have been influenced by two of the biggest aesthetic movements of the late 1990s and early 21st century: installation art and its more interactive twin, relational aesthetics. 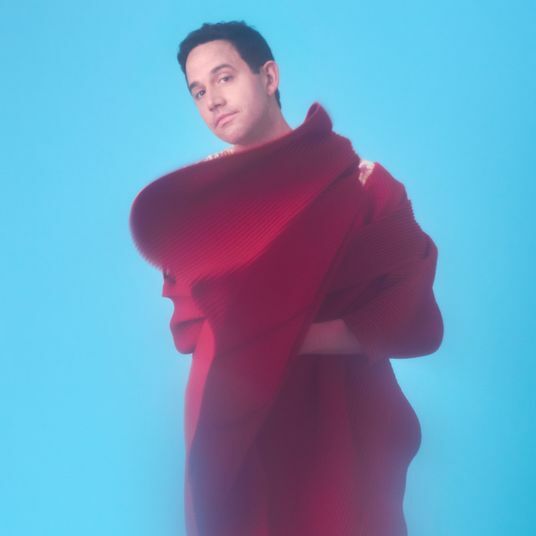 These are the very styles known for their fun, public-oriented, managed mixes of fabricated setting, multi-screen projections, big production, high-concept design, theory, and theater that are the core DNA of the High Line’s stylized, self-consciously artificial theatricality. Ditto Pier 55 and Culture Shed. As for me, even though art is based on paradox, I am going to reject this one. I’d rather have none of these new spaces, even if it means losing any art that might come with them. That’s how rotten these spaces have gotten.